This monthly covers Fighter's Collection a little, EB10, and TD14/15. Pacifica and Duos get Masquerade units. Q. What kind of ability is "Legion"? A. "Legion" is an ability that calls a Mate to fight together. Legion Mate is put on the left of the vanguard, their power is combined when attack. Q. Until when is Legion in effect? What happened when another unit rides them? A. Legion is in effect throughout the game. When they're being rode, both units which are in Legion are put to soul. Q. During a Legion, is the critical combined? Is Legion Mate's when-placed timing ability can be used? A. The amount that are combined is only the power, there is no changes in critical and drive check. Also, since Legion Mate is called to the vanguard circle, any rearguard when-placed timing ability (when called) cannot be used. Q. When attacking an opponent that is being Legion, what will happen to the power? Can the Legion Mate attacks as well? A. Since the combined power is only in effect during its attack, so the amount of power for the vanguard when receiving an attack is the amount of its original power (plus any trigger effect or any other abilities― anything excluding the Legion's power effect). For the latter, Legion Mate cannot attack. Auto: [CounterBlast(1)] When this unit appears on the Rearguard Circle, if your Vanguard have “Brawler” in its name, you pay the cost. If you do, select 1 of your opponent’s Front Row Rearguard, Retire it. Auto [V]: When this unit becomes Legion, select one of your opponent’s Front Row Rearguard, Retire it. 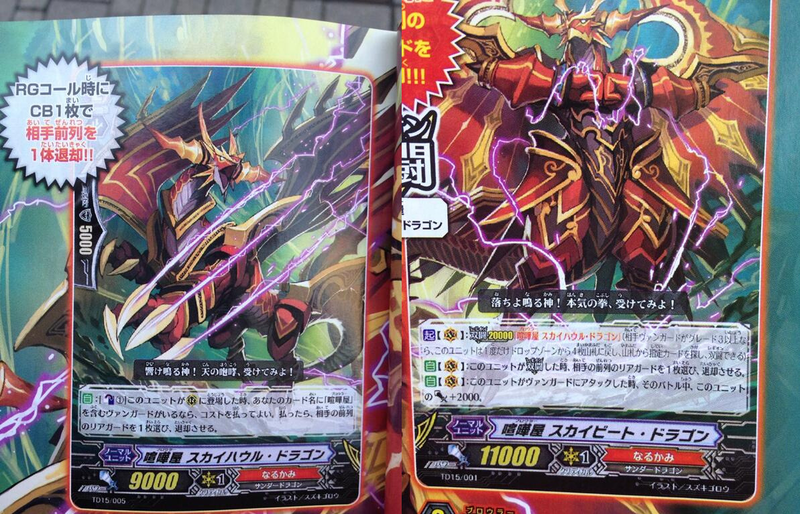 Auto [V]: When this unit attacks a Vanguard, during this battle, this unit gets Power +2000. [AUTO](RC): When this unit boosts a vanguard, if that vanguard is in Legion, the boosted unit gets [Power]+4000 until end of that battle. [AUTO](V): When this Unit attacks a Vanguard, if this Unit is Legion'd, it gains 5000 Power during this battle. [AUTO](R): When this Unit attacks a Vanguard, it gains 2000 Power during this battle. AUTO](VC) Limit Break 4 (This ability is active if you have four or more damage):[Counter Blast (2)] At the end of the battle that this unit attacked a vanguard, you may choose two cards with "Duo" in its card name from your hand, and discard them. If all of the discarded cards have the same name, you may pay the cost. If you do, [Stand] this unit, and this unit gets [Power]+3000 until end of turn. This ability cannot be used for the rest of that turn. [AUTO](VC):[Soul Blast (1)] When this unit attacks a vanguard, you may pay the cost. If you do, choose one of your rear-guards with "Duo" in its card name, and return it to your hand. 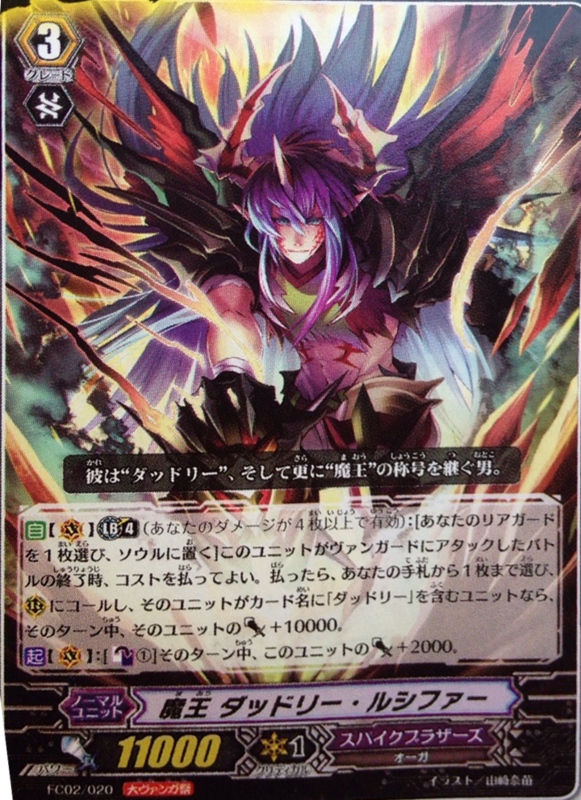 [AUTO](VC) Limit Break 4 (This ability is active if you have four or more damage): When a «Bermuda Triangle» rides this unit, choose your vanguard, and until end of turn, that unit gets [Power]+10000 and "[AUTO](VC):[Counter Blast (1)] When this unit attacks a vanguard, you may pay the cost. If you do, return all of your «Bermuda Triangle» rear-guards to your hand, then choose up to two «Bermuda Triangle» from your hand, and call them to separate (RC)". 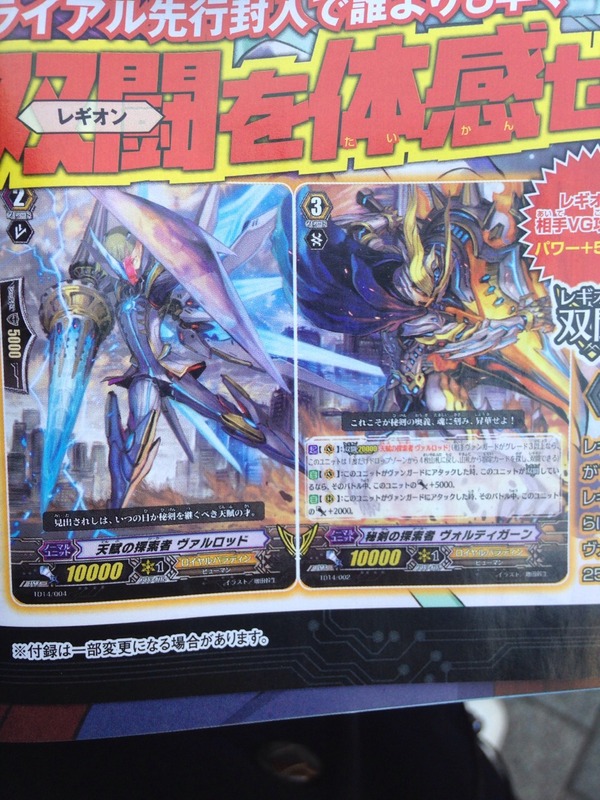 [CONT](VC): During your turn, if the number of «Bermuda Triangle» rear-guards you have is four or more, this unit gets [Power]+2000. [ACT](VC) Limit Break 4 (This ability is active if you have four or more damage):[Soul Blast (1) & Choose a card named "Duo Stage Storm, Iori" from your hand, and discard it] Choose one of your «Bermuda Triangle» rear-guards, return it to your hand, and choose up to two cards with the same name as the returned unit from your deck, reveal it to your opponent, put it into your hand, and shuffle your deck. 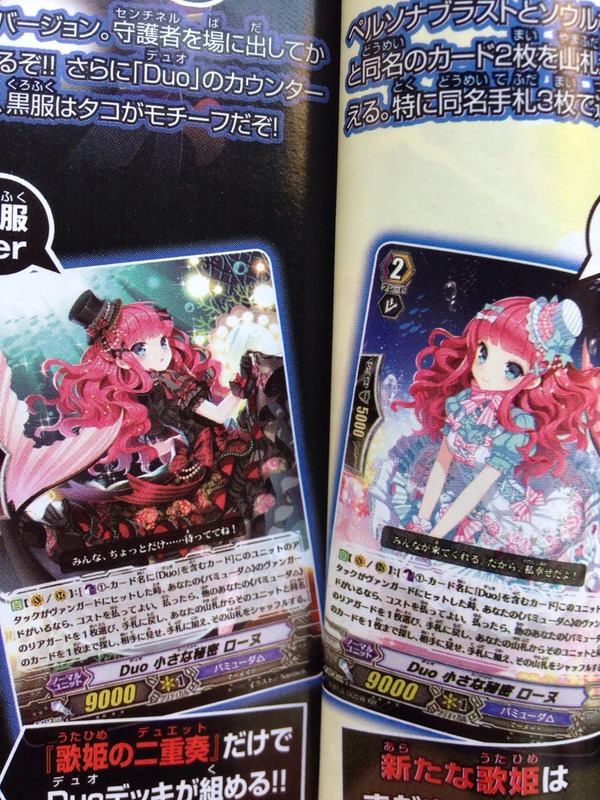 [ACT](VC):[Counter Blast (2)-card with "Duo in its card name] This unit gets [Power]+5000 until end of turn. AUTO: [Counter Blast (1)] When this unit is returned to hand from a rear-guard circle, if you have a vanguard with "Duo" in it's card name, you may pay the cost. If you do, draw a card, choose up to three cards named "Duo Far Marine Chateau, Thames" from your hand, and you may reveal them. If you revealed three, choose one card in your damage zone, and turn it face up. 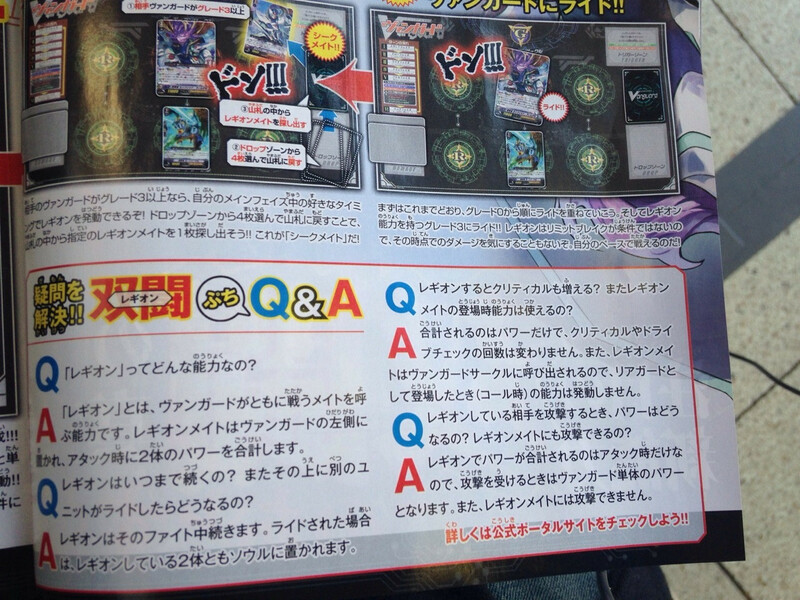 AUTO [V/R]: [Counter Blast (1) - Card with "Duo" in it's card name] When this unit's attack hits a vanguard, if you have a <Bermuda Triangle> vanguard, you may pay the cost. If you do, choose one of your other <Bermuda Triangle> rear-guards, return it to your hand, search your deck for up to one card with the same name as the returned unit, reveal it to your opponent, put it into your hand, and shuffle your deck. ACT [V] Limit Break 4 (This ability is active if you have four or more damage): [Counter Blast (1) & Soul Blast (1)] Choose one of your <Bermuda Triangle> rear-guards, return it to your hand, and this unit gets [POWER] +3000 until end of turn. Choose up to one card with "Coral" in it's card name from your hand, and you may put it into your soul. If you do, draw two cards. This ability cannot be used for the rest of the turn. 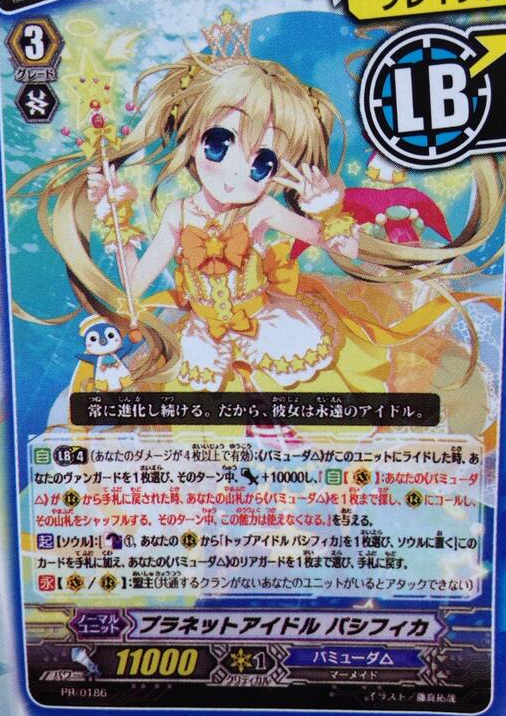 CONT [V]: If you have a card named "Aurora Star, Coral" in your soul, this unit gets [POWER] +2000. CONT [V/R]: Lord (If you have a unit without the same clan as this unit, this unit cannot attack. 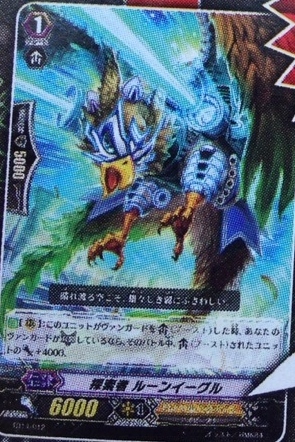 AUTO [V] Limit Break 4 (This ability is active if you have four or more damage): At the end of the battle that this unit attacked a vanguard, choose a grade 3 <Bermuda Triangle> from your hand, and you may ride it as [REST]. 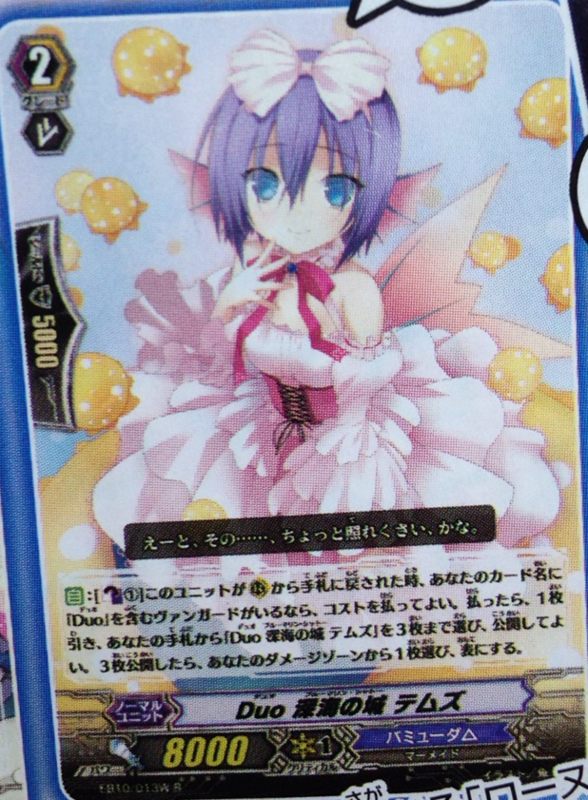 If you do, choose a card named "Costume Idol, Ark" from your soul, put it into your hand, and draw a card. AUTO: [Soul Blast (1)] When this unit is placed on a vanguard circle, you may pay the cost. If you do, choose up to one of your <Bermuda Triangle> rear-guards, return it to your hand, and this unit gets [POWER] +5000 until end of turn. [AUTO](VC) Limit Break 4 (This ability is active if you have four or more damage):When a «Bermuda Triangle» rides this unit, choose your vanguard, and until end of turn, that unit gets [Power]+10000 and "[AUTO](VC): When your «Bermuda Triangle» is returned to your hand from (RC), search your deck for up to one «Bermuda Triangle», call it to (RC), and shuffle your deck. This ability cannot be used for the rest of the turn". 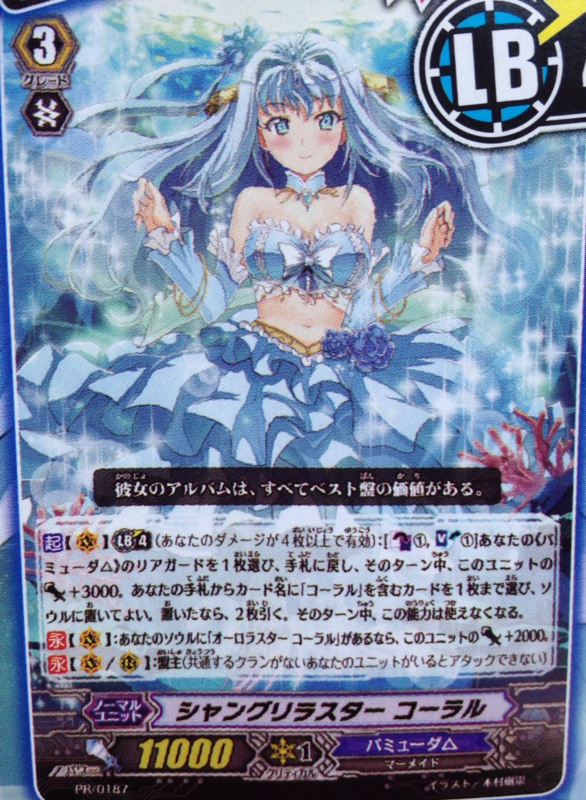 [ACT](Soul): [Counter Blast (1) & Choose a card named "Top Idol, Pacifica" from your rear-guard circle, and put it into your soul] Put this card into your hand, choose up to one of your «Bermuda Triangle» rear-guards, and return it to your hand. 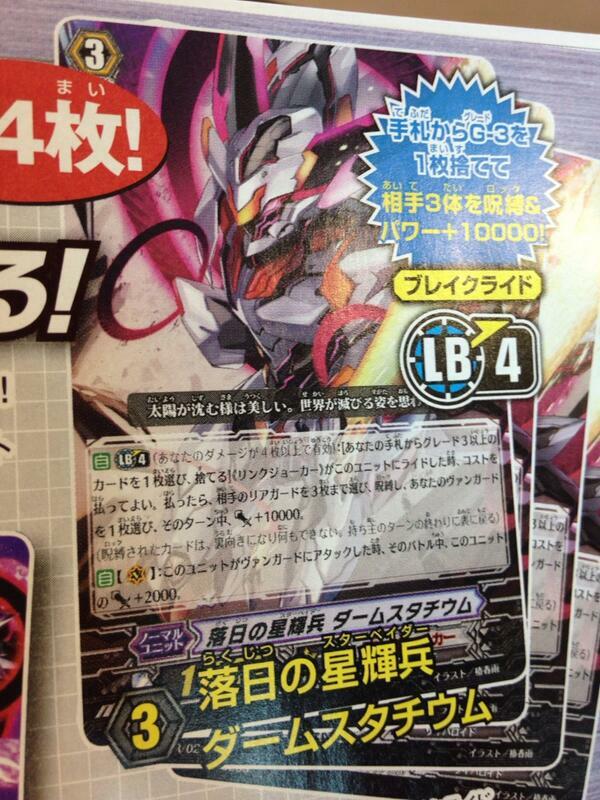 [Auto] LB:4: [Discard a Grade 3 or higher card from hand] When «Link Joker» rides on this, you may pay cost. If the cost is paid, choose up to 3 of your opponent’s Rearguards and lock them, and your vanguard gains +10000 Power for the turn. [Auto] [(V)] When this card attacks a vanguard, this unit gains +2000 Power for the battle. AUTO [V] Limit Break 4 (This ability is active if you have four or more damage): [Choose one of your rear-guards, and put it into your soul] At the end of the battle that this unit attacked a vanguard, you may pay the cost. If you do, choose up to one card from your hand, and call it to a rear-guard circle, if that unit has "Dudley" in it's card name, that unit gets [POWER] +10000 until end of turn. 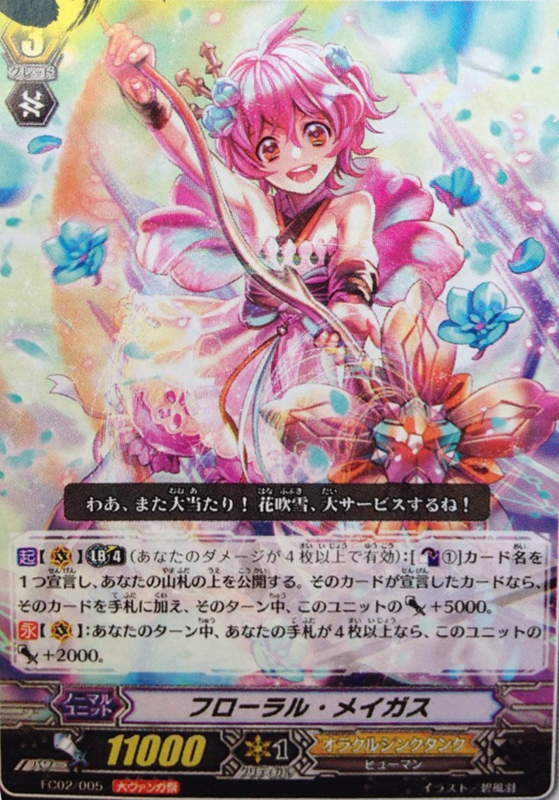 ACT [V]: [Counter Blast (1)] This unit gets [POWER] +2000 until end of turn. ACT [V] Limit Break 4 (This ability is active if you have four or more damage): [Counter Blast (1)] Declare one card name, and reveal the top card of your deck. 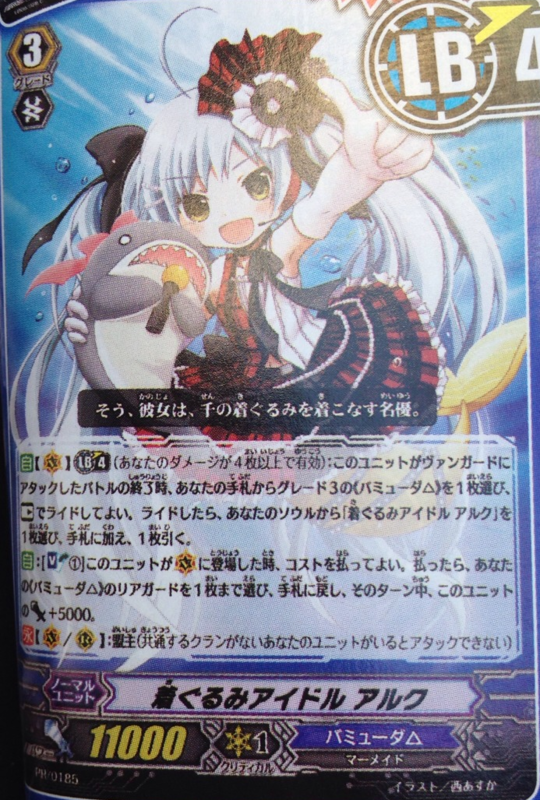 If that is the card you declared, put it into your hand, and this unit gets [POWER] +5000 until end of turn. 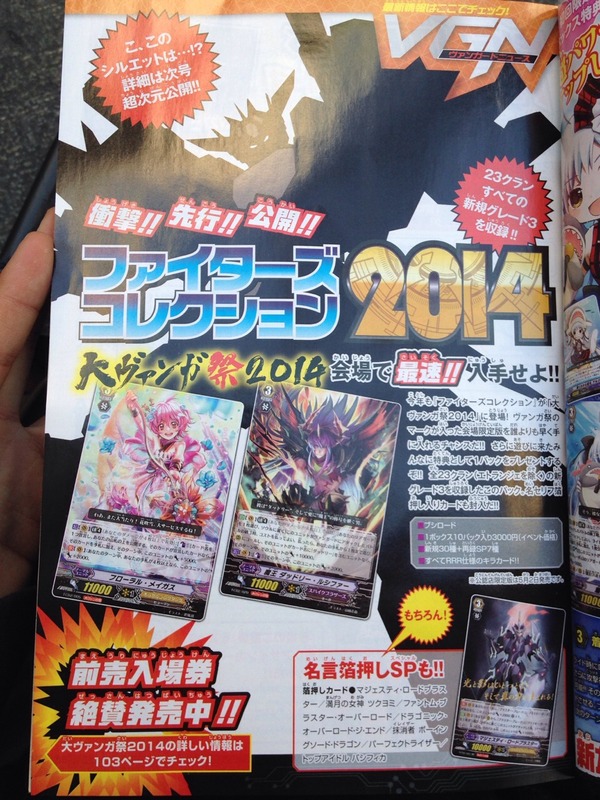 CONT [V]: During your turn, if the number of cards in your hand is four or more, this unit gets [POWER] +2000. Next month is Fighter's Collection 2014! SP Rarity Majesty Lord Blaster reprint included! Every single clan is getting a brand new Grade 3 unit! Star-Vader Something. Name of the year. No one should even alter it. Those lolis really caught my attention. I need the new Bermuda Triangles......very much.